This is the Rhino 45 Gallon Vertical Stacking Tank. Effectively organize your bulk fluid inventory, eliminate the hassle of handling 55-gallon drums and maximize valuable floor space with Rhino Tuff Tanks stackable tank systems. 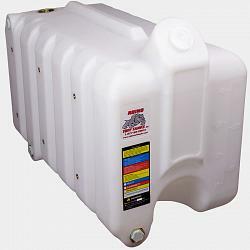 Individual tanks are designed with a common 36" x 36" footprint among all sizes. Tanks can be securely stacked with each other in any combination without requiring costly conversion brackets or racking. Using Natural Virgin High-Density Polyethylene resins, Rhino Tuff Tanks provide a clean, stable, contamination-free container that will not rust or corrode - protecting your fluids from the environment. Combine with an array of accessories to create your own unique storage and dispensing system. RTT Systems have been certified as compliant with ULC 142.14-03 testing standards and bear the markings as such.